Taking your dog on a plane with you can be a real adventure or a complete disaster. 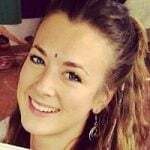 And the factor that decides it? The airline approved pet carrier. To keep your furry pet safe and sound and yourself relaxed and worry-free during the flight, it’s important to invest in a quality airplane approved pet carrier. Since air travel is quite stressful for canines, you need a reliable pet crate that will not only meet all airline requirements but keep him comfortable during the entirety of the flight. To help you find such a crate, our research team has checked major airlines’ rules, regulations, and recommendations for pet traveling, and read dozens of reviews of dog crates. 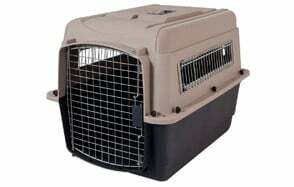 The result is the list of what we think are the best airline approved dog crates on the market. Check out it out, as well as our buying guide and FAQs section to learn all there is to know about flying with your pet and how to pick the right crate that will not only fit your pup but your own budget too. 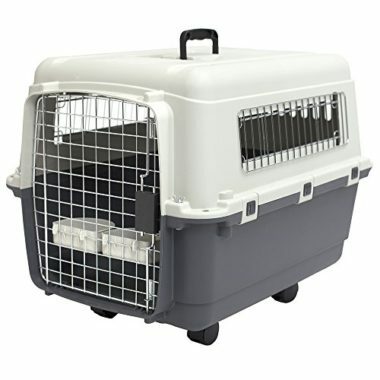 If you’re looking for a durable, convenient and comfy airline approved pet carrier that is also on the affordable side, you’ve found it – it’s the Petmate’s Two Door Top Load Kennel. This handy little travel crate comes with everything you need for a safe travel with your dog as it has two doors –the top loading one and the front one – and plenty of openings for visibility and ventilation. 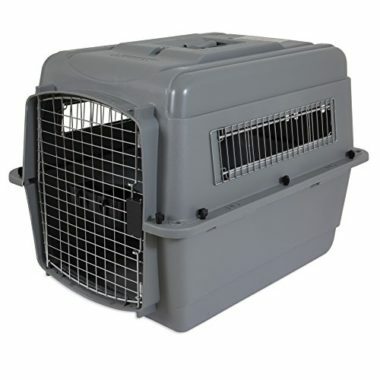 This travel crate's double doors are made of steel, which means you can relax about your pet chewing on the grates and ruining the kennel– he won’t be able to. The doors are easy to secure too, as they come with an easy-open latch that allows you to open either door quickly and with one hand. Importantly, the kennel provides plenty of fresh air and maximum visibility as it has vented sides, so your dog is guaranteed to be comfortable and relaxed during the flight. The Petmate 2 Door Kennel meets most air travel requirements, but of course, you should contact your airline prior to traveling for verification of their specific requirements. Designed for small pets in mind, this travel crate is available in two sizes– it’s ideal for petite dogs or puppies. If you have a boisterous, hyper-excited dog, it’s highly likely he won’t like being put in a cage, no matter where you two are flying. Such pets are bound to chew and scratch the crate, so it’s imperative to buy a durable, secure product. The Aspen Pet kennel is such a cage. Made of heavy-duty plastic shell and metal bolts, this crate is secure and easy to assemble. The door, which is in the front of the cage, comes with an easy-open latch which allows quick and easy opening with only one hand. 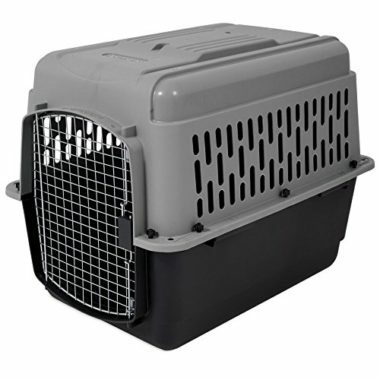 There are ventilation openings all around the crate which ensure proper air flow and allow your dog to freely look around. This portable dog crate meets most air travel requirements but you should check with your specific airline, just to be sure. Since the crate comes in multiple sizes, it’s easy to find the right product for your pet. Another highly convenient travel cage by Petmate, the Sky Kennel is a perfect airplane approved dog crate that comes in multiple sizes. Made of durable plastic and non-corrodible wing-nuts, as well as strong steel wires, this portable kennel is safe, sturdy and, equally important, comfortable for the pet. This crate has one (front) door that is made of strong steel wire, so chewing and biting won’t damage it. In fact, the larger size kennel has a vaulted door that features horizontal support for extra protection, so even the rowdiest dogs will be kept inside safe and sound. As a bonus, the XL kennel is made with recycled materials, which is always a plus but is a must-have for environmentally conscious pet parents. As for ventilation, there are several openings, albeit small-ish, which ensure proper air flow. Of course, the Sky Kennel meets most airline requirements, but as usual, you should make sure it meets your specific airline’s guidelines. The crate comes in various sizes so picking the right product for your pet shouldn’t be a problem. 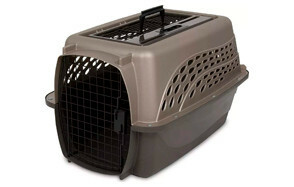 The SportPet Designs dog crate is one the sturdiest, most durable dog travel crates on the market. It’s secure, easy to assemble, comfortable for the pet, highly convenient and guaranteed to last for years to come. Of course, that’s why it’s a bit more expensive than the rest of the travel crates featured here, but it’s definitely worth the price if you travel often and you want excellent quality. Made of durable plastic plus metal bolts and nuts, this kennel is guaranteed to keep your dog safe and comfy every time you travel. It’s quite spacious too and can fit even large dog breeds with no issues whatsoever. There are multiple ventilation openings on all sides, although the ones on the side of the kennel are smaller. Nevertheless, proper airflow is ensured and your pet can freely look around through the front door. Conveniently, the crate comes with wheels that snap on and off as needed, so you’ll have no problem transporting your pooch no matter where you’re going. The SportPet kennels meet IATA requirements. They come in multiple sizes, so picking the right crate shouldn’t be difficult– just be aware that the sizing chart can be a little be off, so it’s better to choose the bigger size, just in case. If you’re looking for a cute, secure pet crate either for traveling by your car or flying, or for crate/house training, the IRIS Delux is the pet crate you need to check out. Durable and hard-sided, with plenty of ventilation and a convenient foldable carry handle, this pet travel carrier is all you and your furry friend will ever need. Made of sturdy plastic, this dog kennel is of good quality and comfortable for the pet. There is one front door that comes with a double-latch, which means you can open it either from left or right – whatever is convenient at the moment (this is only available in small and medium crates though). Conveniently, you can remove the door completely on larger models to create a pet bed for your pooch. As for ventilation, this crate has multiple long and wide openings on all sides, so proper air flow is guaranteed. 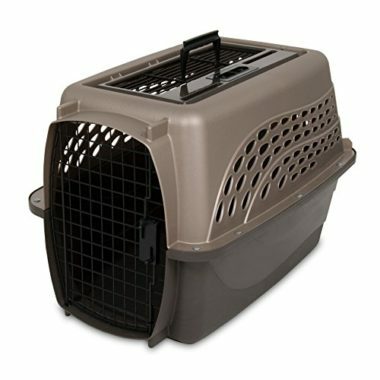 This dog cage meets all general travel standards, but you should always check with your specific airline before traveling. The product comes in four sizes: extra small, small, medium and large. Traveling with your pet can be incredibly fun and thrilling, and although smaller pets are easier to travel with, larger dogs deserve their fair share of traveling too! To help you fly with your big dog, the Petmate has designed the Ultra Vari kennel – spacious, comfy and secure travel crate that will fit even the largest of dogs out there. The shell of the cage is made of durable plastic and it comes with heavy-duty hardware for assembling. Speaking of which, you’ll need no tools to assemble this cage as all metal screws are easy to screw in by hand. The door is made of metal and comes with an easy-open latch which allows you to securely and easily put your pet inside or take him out with one hand. There are multiple ventilation openings all made of wire, which provide air and visibility, although the ones on the side are small. The Petmate Ultra Vari meets most air travel requirements, but you should, of course, contact your specific airline before traveling to ensure everything is according to the rules. The kennel comes in four sizes, so it’s easy to find the right one for your pet. So there you have it – our Top Picks for the best airline approved pet carrier. We tried to include different features, different prices, and different sizes here, so you can find the product that fits best your and your pet’s needs and preferences. 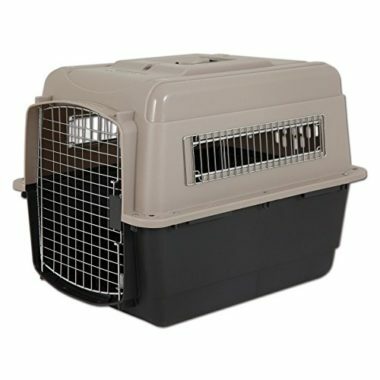 Of course, picking the right airplane approved pet crate is no easy task: the crate has to meet your specific airline’s rules and regulations, it has to be spacious and comfortable for the pet, it has to be sturdy and durable to withstand nervous biters, and it has to fit your budget. No wonder you may feel lost! But that’s why we’ve prepared this handy little buying guide. Here, you can read all about how to safely fly with your dog, including what to look for when buying airline approved pet crates, how to pick the right size and how to measure your dog. We also answer some of the frequently asked questions about the topic, so make sure you check out that section as well. So, without further ado, let’s get into the buying guide! While most airlines allow pets to be transported in the baggage area, some do not. For example, Southwest Airlines doesn’t allow dogs and cats to be transported with checked baggage, which means you have to store your pet under the seat in front of you, which further means that only small pets are allowed. However, all airlines have rules and regulations when it comes to pet transportation. 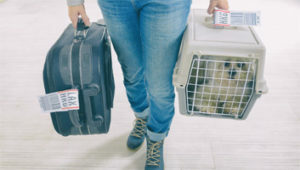 Those that allow animals to be transported in the baggage area (such as American Airlines) have very specific guidelines that need to be met, including the travel pet crate. To make sure your pet is safe to travel either with you as a carry-on or alone in the cargo, make sure your pet travel kennel meets your specific airline’s rules and guidelines. As mentioned, the number one thing you want to pay attention to when looking to buy a travel crate for your dog, is whether or not it meets most airline requirements. All crates featured on our list meet this criterion, however, you should always check with your airline whether or not your kennel meets their specific guidelines. 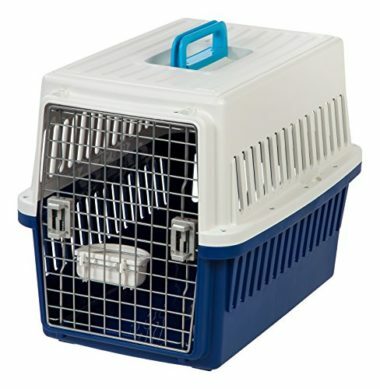 Besides meeting your airline requirements, a travel crate also needs to be the right size for your pet. This is of crucial importance not only because your dog should be comfortable during the flight, but because airlines use certain indications to ensure the pet has enough room to turn normally while standing. The animal should also be able to comfortably sit and stand, as well as to lie in a natural position. For further products like this, check out our review of the best dog crates for travel and home use. Some dogs get nervous when flying and may chew on the kennel in an attempt to relieve their stress (or break free!). That’s why it’s important to choose a pet cage that’s sturdy and secure. Of course, the kneel also needs to be lightweight, which leaves us with – plastic. Most travel crates are made of plastic plus some other material (usually steel bolts, wires, etc. ), and that’s exactly what you want to look for. Make sure the plastic is durable and the entire construction is sturdy – this is especially important if you have a larger dog or you know she gets nervous/excited while flying. Considering your pet will either sit or stand in one cage during the entirety of your flight, it’s crucial to get a comfortable product. This ties into the size of the crate – if it’s the right size, your dog will be able to comfortably lie down, move, turn around and sit. If it’s not… well, let’s just say your poor pet will be very unhappy. Besides the right size, make sure the kennel can fit other things your pet may need during the flight, including a pillow or absorbent bedding, and food and bowls. As you can probably tell by now, getting the right size dog crate is of utmost importance. There are two major reasons for this. The first one is the comfort of your pet – if you pick the wrong size, your dog may actually physically suffer during the flight. Usually, pet parents pick a size too small for their dog which can lead to animal discomfort as they’re unable to sleep or relax. For this reason, if you’re unsure about the product’s size chart and how it translates to real life, it’s wise to pick a larger size, just in case. The second, equally important reason you need to choose the right sky kennel size is because most airlines have strict guidelines about the size of pet crates. If the airline considers your kennel too small for your dog, you will be rejected. Lie in a natural position. If you need more specific details about measuring your pet for the crate, the IATA offers a detailed list of requirements (starting from page 3) that should help you. Q: How can I tell the difference between dog crates, dog kennels, and pet carriers if they’re all called kennels? 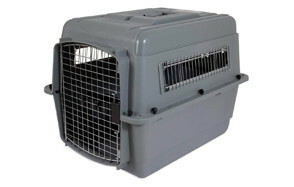 A: Although there are differences between a dog crate, kennel and carrier, when it comes to airplane approved pet carriers, they’re all the same. However, outside of that, pet crates or kennels and pet carriers are different things. Pet crates/kennels could be considered as the Jack of all trades – they can be used for traveling by plane, car, train and around the home if you’re trying to housetrain/kenneltrain your dog. Pet carriers, on the other hand, are used for small breed dogs while traveling by car or foot. There’s also a difference in the materials: kennels or crates are made of plastic or other durable material (especially airplane approved crates), while dog carriers are made of fabric, which can be more comfortable for the animal. Q: How should I prepare the pet carrier? Properly assemble the cage: make sure everything is screwed in properly, fastened and if necessary, zipped. Follow the instructions that come with the crate carefully. Attach the stickers: most crates come with everything you need, including the Animal stickers, which you should attach to the outside of the crate. The filled out Declarations sticker should be on top of the crate. Provide the certification: attach a vinyl sleeve of copies of your dog’s veterinary certifications, as well as your contact information with a tape to the top of the crate. Clean the container: the crate needs to be washed with soap and water and disinfected if reused. Absorbent bedding should also be placed inside. Provide food and water: normally, animals do not require additional feeding during 12 hours following dispatch, but water should be provided if the total journey lasts more than 12 hours. In any case, separate food and water troughs must be provided. Q: Where in the aircraft will my pet go? A: Small dogs can go in the cabin and will be stowed beneath the seat in front of you. However, some airlines don’t allow pets in the cabin no matter their size, which is why it’s always best to check with your specific airline first, so you can prepare yourself and your pet. Larger pets will be transported as special baggage in a ventilated hold. However you end up transporting your pet, know that airlines generally take very good care of passengers’ pets. Q: Can I take my pet in the cabin? A: If your pet is deemed to be small enough by your airline’s guidelines, you’ll be able to take it with you, in the cabin. However, some airlines do not allow pets in, no matter their size and breed, in which case they’re transported as special baggage. Q: Should I sedate my pet? A: IATA recommends not sedating pets, and the American Veterinary Medical Association agrees – unless certain conditions require it or the veterinarian recommends it, that is. This is because commonly used tranquilizing drugs lower the blood pressure of the animal which is also what naturally occurs at high altitudes. This can lead to heart ad respiratory problems.